MADERA, CALIFORNIA (March 1, 2018) – The Madera Speedway today announced that Nut Up Industries has joined the Madera Speedway family of partners as a major sponsor for the 2018 MAVTV-televised racing series. Nut Up joins RPM Mortgage and 51FIFTY Energy Drink among the great variety of California companies that will support the one-third mile oval this season. Nut Up is a family-owned almond company located in Escalon, California that produces roasted “CHOPPED” flavored almonds, whole flavored almonds, almond butter and almond flour. Nut Up products are currently available in Nut Up’s online store and at California retailers including Save Mart, 7-Eleven, Costless and Food Maxx. The Sixth Annual “Nut Up Short Track Shootout” will be on October 6th, where drivers in both the RPM Mortgage Pro Late Models and 51FIFTY Energy Drink Jr. Late Models will compete in televised races, joined by the Lucas Oil Modifieds as well. The crown jewel is the 150 lap, $10,000 to win Pro Late Model race. Nut Up will award the “Great Taste Award” for each of the 18 televised events at Madera, awarded to the driver who displays the most sportsmanlike move of the race. This driver will receive a free entry into the following televised race. An expanded “Nut Up Post Race Show” and additional in-car cameras will also be added to the broadcast as a result of the partnership. 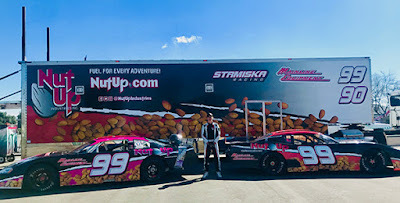 Regional promotions tied into the partnership include car shows, promotional appearances, television commercials, and opportunities to meet Madera Speedway drivers. The 2018 season Madera is fast approaching with nine nights of RPM and 51FIFTY-backed competition plus four Super Late Model events and several open wheel events that will showcase the best young talent in the nation. The $5,000 to win RPM Mortgage Pro Late Model Series opens the season on March 10th! Madera Racing on MAVTV airs Thursdays re-runs of the 2017 season every week. The show airs at 5 p.m. and 8 p.m. PST and is also available on the Lucas Oil Racing TV app.